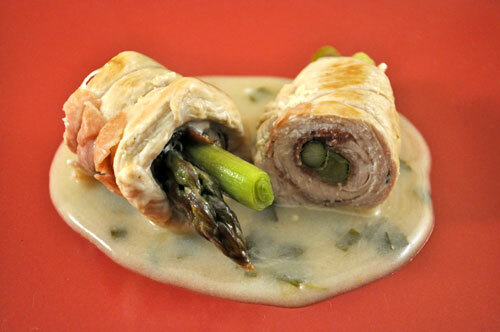 Fresh, green asparagus and green garlic, wrapped in turkey…. These rolls are full of spring flavors, the antithesis of the Beef Rolls I posted on Monday. The mild flavor of turkey is the perfect foil to lightly poached spring vegetables. Finish with a light, tarragon infused white wine sauce…. 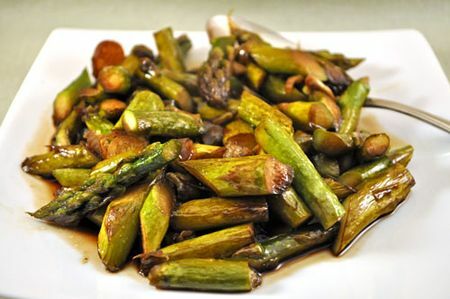 Trim green garlic, reserving white end, and cut to same length as asparagus. Poach asparagus and green garlic in boiling water for 3 minutes. Lay asparagus and green garlic on Prosciutto, letting the tips hang out a bit. Roll up and tie securely with kitchen string. Heat oil in medium skillet. Add rolls and brown well on all sides, adding chopped green garlic mid-way. Add wine, stock, tarragon, cover and simmer for 20 minutes. Remove rolls and keep warm. Increase heat under skillet and add cornstarch mixture, stirring until thickened. Stir in yogurt and remove from heat. Remove string from rolls, cut each in half (looks nicer),. Spoon a bit of sauce on to a plate, top with rolls and serve. We found a local farm that grows green asparagus. That’s not the norm here, or in most of Europe. White is preferred, big, thick white spears. The second favorite is the thin, purple-tipped white asparagus, called violet. But not at our house. But, as the green is not so common, it’s a real treat. That’s 4.4 pounds for the conversion-impaired. We ate a lot of asparagus last weekend. 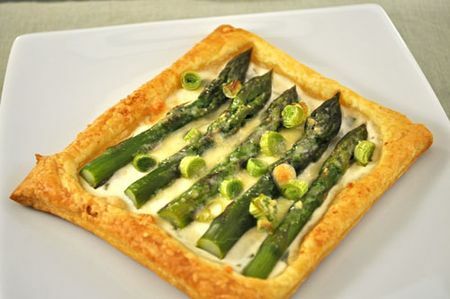 Along with the Turkey Rolls we had Asparagus Pastries as our first course – topped with a sprinkle of green garlic. Do you detect a them here? Our own, private Asparagus Festival…. Occasionally we see white asparagus but never the purple here – thin very green spears are the most popular and it gets quite cheap too – luckily. We are happily awash in asparagus right now and I’m loving it. 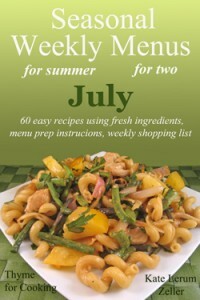 I’m also loving this recipe and plan to make it this weekend. Thanks so much Katie! That top picture…. oh my. I would like to sleep in a bed of tarragon some day. Wouldn’t that be wonderful? Christine, isn’t it a great season?! ?